On May 9th, I will be a part of the “Women & the Art of Architecture” event co-hosted by AAUW, LFA and AIAOC. Below is the article written by Janice Hayden and Elliot Quint, ideators and organizers of the event. Juintow Lin became interested in architecture when her house burned down while she was a freshman in high school. After her family engaged an architect for the rebuild, she was fascinated by the trade and decided to become an architect. Her passion led her to MIT, and later on a career path in New York, London, China and elsewhere. She is the founder and principal at Foxlin Architects in San Clemente designing contemporary, sustainable residences and commercial structures. Lin is one of ten successful women architects from Orange County who are part of “Women and the Art of Architecture”, an event taking place on May 9that Neighborhood Congregational Church from 6:30 – 9 pm. The American Association of University Women – Laguna Beach (AAUW-LB), Laguna Friends of Architecture (LFA), and the American Institute of Architects Orange County (AIAOC) will host this free of charge event, which includes a slideshow of the architects’ work, a portable gallery “museum wall” celebrating past pioneering California women architects, and a moderated panel discussion. Women have made great progress in this historically male-dominated profession, today constituting more than half of all students enrolled in accredited architecture programs. 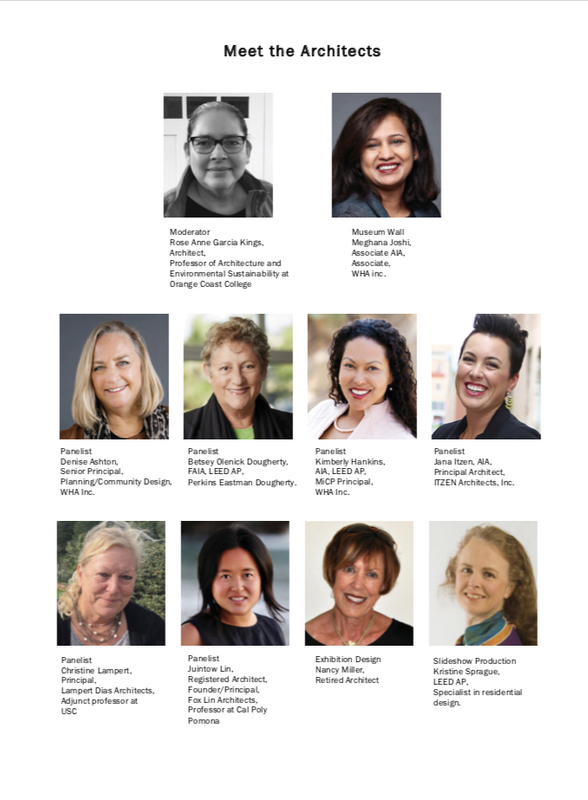 Collectively, these ten women architects have worked in Orange County, Los Angeles, New York, London, Hong Kong and elsewhere. They have designed commercial buildings, health care facilities, community facilities, retail, multi-family housing, private residences, senior and affordable housing, and have done planning, design, and historical renovation. They have done research on Sustainable Urban Housing in China, invented an artificial intelligence-powered smart safety device, and have done large scale land planning. They include professors at Orange Coast College, Cal Poly Pomona and USC. The women are at different stages in their careers – Associates, Principals, and Owners. They range from mothers busy with school-aged children up through working grandmothers and a retiree. Several of these women followed a parent into architecture. Some are passing on the career to their own children. Bestey Olenick Dougherty established her own firm of Dougherty + Dougherty (now Perkins Eastman Dougherty). Then both her son and daughter followed in her steps and became architects. “Architecture is a rewarding career path with intrinsic rewards… we can positively impact the design future of both the built and natural environments”. “I believe that we should all be mentors to others in our lives, including architects, students, friends and family”. Christine Lampert, founder and principal architect of Lampert Dias Architects, practices what she preaches. She has served on several boards in Hong Kong as well as here in California. She teaches architecture at USC, having previously taught at Cal Poly Pomona, Orange Coast College and SCAD Hong Kong. The evening will begin with refreshments and time to socialize, while viewing slides of the architects’ work and the Museum Wall. The Wall is part of Meghana Joshi’s Project Amplify project, designed to amplify the contributions, achievements, voices and works of women in architecture through social media and write-ups in Wikipedia. This display celebrates twelve accomplished pioneering women in California architectural history, including Lillian Rice and Julia Morgan. They scaled walls, shattered ceilings, and kicked open doors of opportunity for others to follow. The presentation will follow: a panel discussion with six of the architects moderated by Rose Anne Garcia Kings, an architect and Professor of Architecture and Environmental Sustainability at Orange Coast College.